This auction is for a most magnificent antique 1890's to 1900 Victorian ballgown. Still with it's Victorian designer stamp impressed on the corset band in green.
" 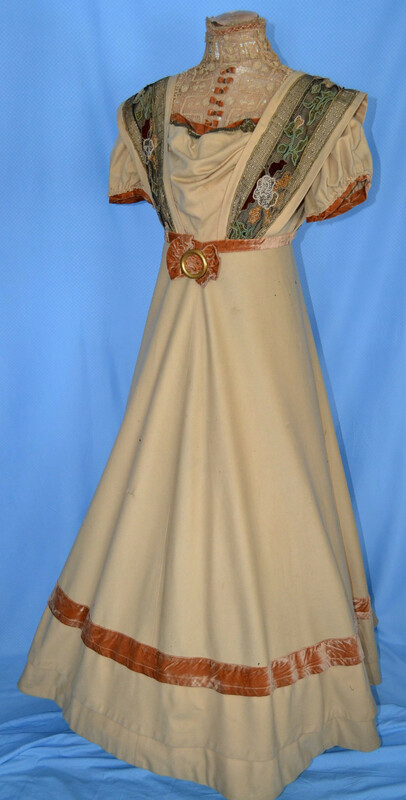 Madame 4119 Westminster Ave "
This magnificent dress needs restoration...see below. Camel colored wool dress with exquisite handmade lace bodice insert and high boned collar. 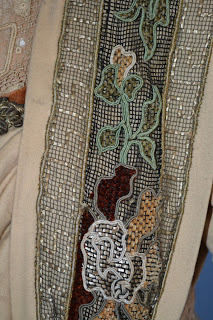 The dress features the most incredible trim of woven passementerie metal thread. This weaving is then decorated with woven silk chenille threads in Art Nouveau floral design. These designs are then edged with handsewn silk cording. Beautiful mix of silk compliment the camel wool exceptionally well. The dress is also trimmed with tiny metal thread wrapped velvet bows, velvet edging which is hand embroidered. Large matching velvet bow front waist with brass buckle...needs to be restitched to hold in place. To add further beauty stunning handmade lace ruffles trim the high collar edge and lower sleeve cuffs. Tons of gathers in the skirt rear to accomodate both your hoop skirt and wire cage bustle . Early hook & eyes up dress back. 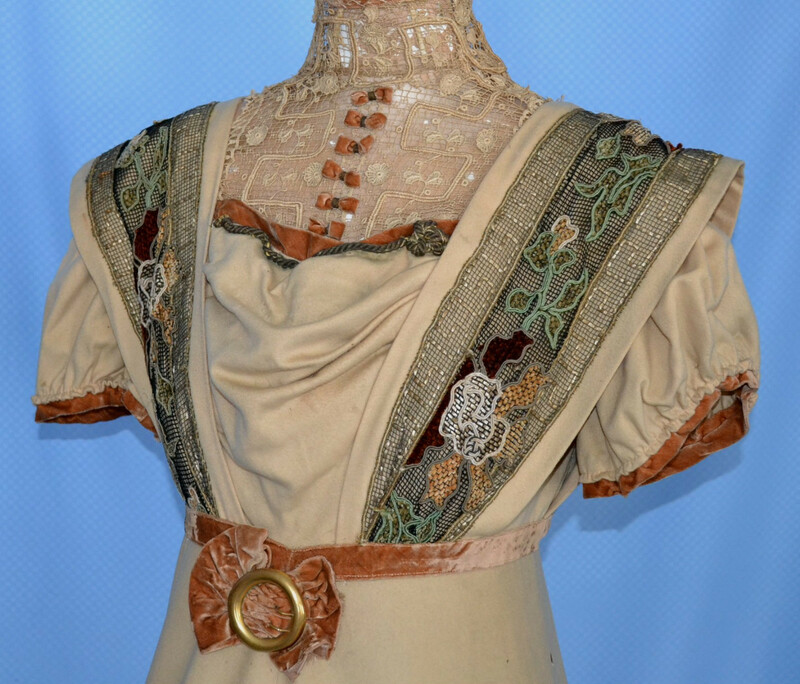 Just an amazing, genuine 1800's Victorian dress for display. The following flaws are noted: The ivories silk lining within the corset top is shattered and of no value. All corset stays remain in place however. The lace collar and lace sleeves originally had a sheer silk lining which is long gone. This loss has caused the lace sleeves to be seperate from the dress. This same sheer lining loss has caused the bodice lace to seperate at the dress shoulders. Apparently this sheer silk backed all of the handmade lace. I have it pinned in some areas to hold together and you could easily do the same with the cuffs to reunite for displaying....see flaw photos below. Some missing hooks and eyes in back with some spotting from location. High collar stays need a few neatly placed stitches to resecure. Lace damage lower back collar. Missing portion of passementerie rope trim...this is an easy restoration. There are small holes in the skirt's wool and the wool does need some cleaning, especially back train area....see photos below. Overall this is in amazing condition for it's age...I am being very thorough in my description of flaws. This does need to some work, but it is quite the Victorian piece! This was a very expensive dress in it's day and was surely much admired. Once the bodice is restored and properly cleaned, I imagine this shown on museum display as an early designer piece. Measurements will not be given to discourage buyers who think they can wear this....this is a treasured display piece! With some restoration & cleaning, this spectacular dress is sure to be one of your most prized 1800's Victorian clothing posessions! No, dear seller, this is not a ballgown (seriously? Wool for a ball gown?) nor is it from the 1890's. 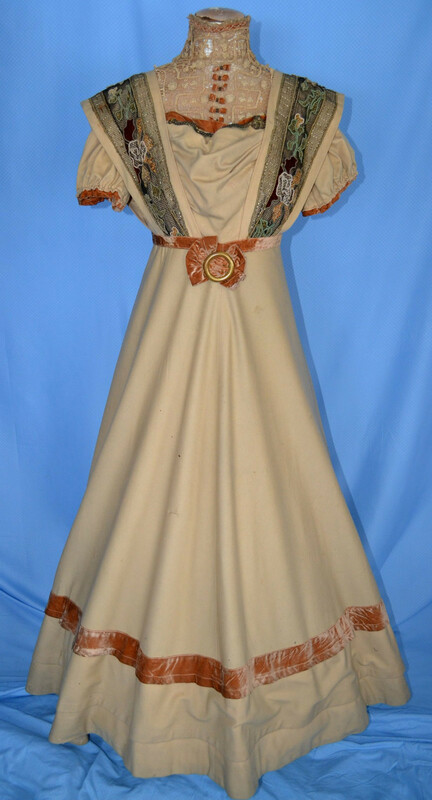 This lovely dress is from about 1909.